Glock 19 9mm 15rd ETS Mfg Magazine, Smoke, New. 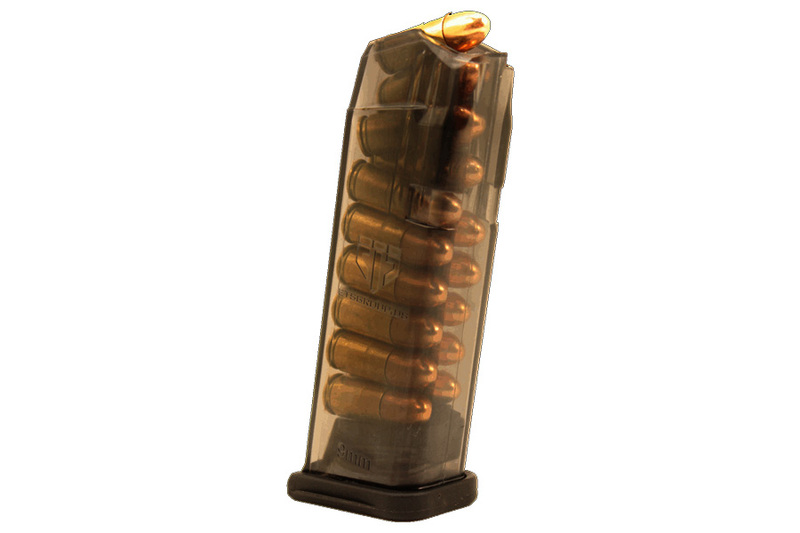 New ETS (Elite Tactical Systems) 15rd drop free 9mm magazine for the Glock 19 and similar (26). 8ft extreme impact resistant, chemical resistant, UV and temperature resistant, and lips and body will not spread when being stored long term loaded. Translucent smoke body allows easy round count. Has ambidextrous mag lock cuts for use in Gen 3 or Gen 4 pistols. Made in the USA. Very well made and perform just as well as the factory mags. Haven't run rounds thru these yet, but initial appearance they don't seem as durable as Block mags. They are interesting though, so as long as they work, who can complain? Took a chance but ordered these mags after reading the reviews. I was NOT disappointed in them at all. I took them to the range the next day and they performed as well as the OEM Glock mags that I have been buying for quite a bit more. Time will tell if they hold up as well, but in the meantime they are working perfectly and I am very pleased with them and will be ordering more!